Went 2 the Bridge: Al-Maliki Regime "Out Of Hellfires" So Uncle Sam To The Rescue? Al-Maliki Regime "Out Of Hellfires" So Uncle Sam To The Rescue? Sometimes the rhetoric of my government parroted by the corporate press is both terrifying and idiotic in the same breath. Most of my fellow citizens in the heart of the empire read such nonsense without much analysis. They have been told enough times that ISIS = bad terrorists and they are largely unaware that elements in the U.S. government were eager to support ISIS in Syria where they were trying to topple Assad's regime. Now that ISIS is trying to topple the U.S. backed Al-Maliki regime in Iraq, they are not our guys. The fact that they are only one small -- albeit well-funded and heavily armed -- faction of the popular resistance in Iraq is ignored. So is the fact that by backing Al-Maliki the U.S. is essentially siding with Iran. 'Cause they're supposed to be super bad guys too, remember? Luckily for the warmongers almost no one in the U.S. does remember or ever knew in the first place that by invading Iraq in 2003 we set the stage for Iran to achieve major influence in the Iraqi government that replaced Saddam Hussein. Widespread ignorance and confusion result when people look for analysis to t.v. shows full of the same talking heads who lied the U.S. into attacking Iraq in 2003. 2003, Washington DC: Desiree Fairooz confronting Condoleeza Rice, then Secretary of State who was urgin the U.S. to invade Iraq in order to topple Saddam Hussein's regime. Some of them made a fortune on the Hellfire missile and other munitions used to destroy Iraq's infrastructure, people and towns. Others make a ton of money for pontificating on foreign policy. They appear quite eager to tell the tales that will sell more weapons to either the U.S. or Iraq or both. [Dr. Wafsi] explains how it is the US responsible for sectarianism in Iraq and discusses the evidence that the US funded sectarian death squads in the country, likening Iraq in the 21st century to the '80s Salvador Option (Wikileaks document show this to be the case). Most important, she discusses how ISIS is only one small actor in the country; the Islamophobic, orientalist U.S. media has ignored that there is a much larger revolutionary presence, one that opposes ISIS (and calls them "barbarians"): the General Military Council of Iraqi Revolutionaries. since late 2012, Sunnis in Anbar province and other parts of Iraq had been protesting every Friday right after Friday prayers because of Prime Minister Nouri al-Maliki—who the US has backed since his installation many years ago and has sold him now over $25 billion of arms and training and counting—But Sunnis were protesting against him because he was sending the military into Sunni towns, Sunni enclaves and killing people, detaining people and then, once they were detained, torturing them. There was all kinds of rampant reports of detaining women, them being raped while they were in prison. And definitely don't miss this bracing interview with scholar and veteran Andrew Bacevich. I participated in a couple of informational conference calls last week including a Codepink-organized call with three speakers who offered informed insight. Matt Howard of Iraq Veterans against the war reported that recently 30,000 Iraqi troops put down their weapons in Mosul and observed of U.S. threats, “You can’t bomb a military into picking weapons back up.” Al-Maliki tactics to put down the Fallujah resistance six months ago included bombing the hospital among other humanitarian targets. His view is that the most appropriate role for the U.S. at this point would be the clean up of toxins such as depleted uranium still festering following the U.S. attacks on Iraq and subsequent occupation. Inder Comar, the attorney for Iraqi mother Sundus Shaker Saleh who is suing officials of the Bush administration for war crimes, offered his perspective that the unstable situation in Iraq is the result of when a country ignores the rule of law. He noted that we are witnessing a further breakdown of a country after the U.S. used premeditated force with no plan for what to do after invasion. After 11 years of war, what’s left is chaos because this is what war does to society: destroys institutions and culture. He went on to say, "The way to stop this is to have accountability and some kind of justice for what happened in Iraq. The 800-lb gorilla in the room is the initial, illegal invasion by the U.S."
On a call earlier in the week I heard Phyllis Bennis of IPS observe that ISIS was strengthened by fighting in Syria and is terrifically well-funded, mostly by Saudi backers, but constitutes only a tiny percentage of people in Iraq actively working to accomplish the fall of Al-Maliki's regime. Then, on Sunday, out into the street with Mainers against bombing or otherwise intervening militarily in Iraq. 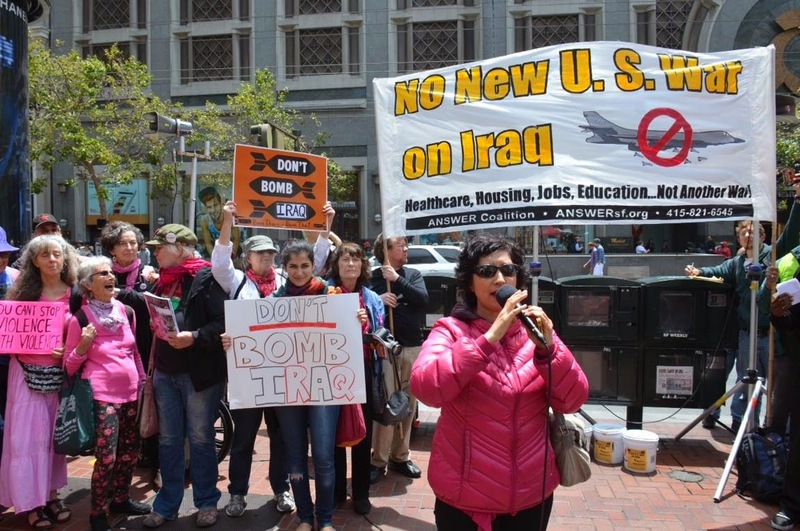 Our action was part of a nationwide outcry -- yet again -- against the U.S. attacking Iraq. If you agree with us, you can sign a petition to Obama here. REVISED June 25: Apparently 50,000 is the correct number of Iraq army troops who laid down their weapons in Mosul, according to "The New Oil Wars In Iraq," an excellent overview of the central role of oil production in the uprisings against the Al-Maliki regime.